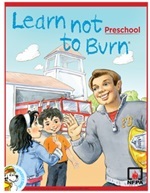 NFPA created the Learn Not to Burn® Preschool Program in 1991 to address the high risks children under the age of five face in regards to fatal home fires. The updated program integrates literacy, movement, music, and dramatic play to provide a developmentally appropriate learning experience for preschool-aged children. Fire District 7 utilizes this curriculum when visiting pre-school and Kindergarten classes. If you would like to schedule a visit from Fire District 7 to your classroom please fill out the online request form and you will be contacted by our Public Education Department. For scheduling purposes, please submit your request for a visit at least 3 weeks in advance. 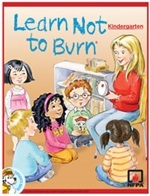 Learn Not to Burn® (LNTB) Kindergarten presents six fire-safety messages using classroom lesson, activities and home connections. It can be taught as a stand-alone fire safety unit or easily integrated in language arts core curriculum lessons. Fire District 7 would love to be invited to your classroom to teach a lesson to support the fire-safety messages within the curriculum. Learn Not To Burn is an easy to use flexible guide for teachers to respond to the needs of the classroom. Make time for fire safety in your classroom. Fire District 7 utilizes this curriculum when visiting Kindergarten classes. If you would like to schedule a visit from Fire District 7 to your classroom please fill out the online request form and you will be contacted by our Public Education Department. For scheduling purposed, please submit your request for a visit at least 3 weeks in advance.